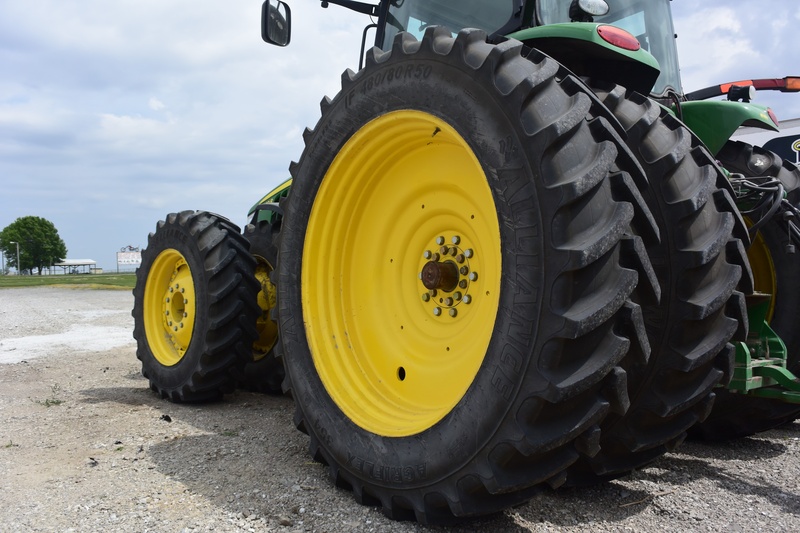 An evolution of the standard radial tire, IF/VF tires are built to keep pace with shifts in the farming industry and the way people farm, most notably the growing size of today’s farms. Larger farms have caused a ripple effect throughout the industry; with farmers now facing longer distances to travel, more land to manage, and larger harvests, they’ve turned to bigger, heavier, and more powerful equipment. The use of this massive equipment has required tires to evolve to meet the new demands of this machinery in two ways: (1) the ability to run a tire at the same pressure with more load than a conventional radial, and (2) the ability to carry the same load with less pressure. IF/VF tires help farmers maximize the advantages of their bigger and heavier equipment by ensuring the power is put to the ground, the machine is capable of efficiently traveling both in the field and on the road, and that this heavier equipment doesn’t cause undue soil compaction and negatively impact yields. IF tires are capable of bearing 20% more weight than a similarly sized radial tire at the same inflation pressure, while VF tires can bear 40% more weight at the same pressure. Another way to get the benefit of IF and VF technology would be to have the tires carry the same load as conventional radials. In that case, IF tires can carry the same load at 20% less inflation pressure—which means about 20% less soil compaction—and VF tires can carry that load with a 40% reduction in inflation pressure/compaction force. Lower inflation pressure offers a host of advantages to farmers, but perhaps none more significant than the reduction of soil compaction. Caused in the moment it takes to run over a piece of ground, the impact of soil compaction can be felt for years by farmers. Today’s mammoth machines put more pressure on the ground than their predecessors, making them more likely to cause compaction. The compaction force exerted by a machine is roughly the same as the inflation pressure of its tires. So if you have tires that need to be inflated to 80 psi, you will exert about 80 pounds of compaction force on the soil. If you can reduce the inflation pressure to 48 psi by using a VF tire, the same load will exert less than 50 psi of compaction force. Of course the benefits of lower pressure don’t stop with reduced soil compaction. IF and VF tires put more tread on the ground for better traction and less slipping, the result of which is better fuel economy. More tire on the ground and better traction also means that more of your machine’s horsepower is being put to the ground and efficiently used—there’s no point in having a 400-horsepower tractor if you can only use 300 of those horsepower! Like other advancements on the farm, from seed technology to drones, the main job of IF/VF tires is to help farmers make more money. Whether it’s helping farmers increase the efficiency of the latest and greatest farm equipment or reducing that same equipment’s potential for yield-inhibiting compaction, IF/VF tires are helping farmers tackle the issues raised by the industry’s evolution. If you’d like to learn more about how IF/VF tires work, check out our Simple Guide to IF/VF Tires or contact your Alliance Tire Dealer today to put our IF/VF tires to work on your farm.